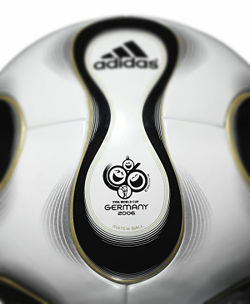 Official FIFA 2006 World Cup match ball. The Fédération internationale de football association (FIFA, French for International Federation of Association Football) is the international sport governing body of association football, also known as soccer. It is the oldest and largest organization of its kind. Its headquarters are in Zürich, Switzerland. FIFA is responsible for the organization and governance of football's major international tournaments, most notably the FIFA World Cup, held since 1930. The need for a single body to oversee the worldwide game became apparent at the beginning of the twentieth century with the increasing popularity of games between national teams. The English-oriented Football Association had chaired many discussions on setting up an international body, but was perceived as making no progress. It fell to seven European countries to band together to form this association. FIFA was founded in Paris on May 21, 1904—the French name and acronym persist to this day, even outside French-speaking countries. It is the oldest and largest organization of its kind. Robert Guérin was its first president. FIFA presided over its first international competition in 1906, but this met with little approval or success. This, in combination with economic factors, led to the swift replacement of Guérin with Daniel Burley Woolfall from England, which had become a member association. The next tournament staged was the football competition for the 1908 Olympics in London. It was more successful despite the presence of professional footballers, contrary to the founding principles of FIFA. Membership of FIFA expanded beyond Europe with the application of South Africa in 1909, Argentina and Chile in 1912, and the United States in 1913. In 1921 Jules Rimet became the third and most influential president of FIFA. In his 33–year–presidency, FIFA established the World Cup, inaugurated in 1930 in Uruguay. FIFA had helped organize the 1924 and 1928 Olympic soccer events but felt the need for its own event, and thus the World Cup was established. It has grown to become the biggest single-sporting event in the world. FIFA, however, floundered during World War I. Many players sent off to war and the possibility of travel for international players was severely limited. Post-war, following the death of Woolfall, the organization fell into the hands of Dutchman Carl Hirschmann. It was saved from extinction, but at the cost of the withdrawal of the football associations from the Home Nations (England, Scotland, Wales, and Northern Ireland), who cited an unwillingness to participate in international competitions with their recent World War enemies. FIFA suspended the World Cup through World War II and reintroduced it in 1950 in Brazil. The Home Nations rejoined FIFA in 1946 and by 1954 FIFA had expanded to 85 member-nations. In 1958, the International Board agreed on its current voting system to allow changes to the game, with four FIFA representatives joining one representative from each of the Home Nations. Television transmission of the 1966 World Cup contributed to FIFA's expansion. Under the stewardship of the current president, Joseph S. Blatter, FIFA has grown to 204 member associations. The FIFA historical collection is held by the National Football Museum in England. In addition to the World Cup and Olympic competitions, FIFA organizes World Championships for players at under-17 age level and under-20 age level. It has also introduced the Confederations Cup, a competition for the champions from each confederation (plus the hosts and World Cup Winners), every four years. Originally organized by and held in Saudi Arabia every two years as the King Fahd Cup, it now serves as a prelude to the World Cup, with the World Cup host staging the tournament as a test of facilities. With the development of the women's game, FIFA introduced the Women's World Cup in 1991 and the Women's under-20 World Championship in 2002 (started as U-19, U-20 since 2006). An under-17 women's championship will start in 2008. FIFA's only major club competition is the FIFA Club World Cup. It was slated as the natural progression of the European/South American Cup to include clubs from all confederations. The tournament was not warmly received at its debut in 2000 and its 2002 tournament was canceled. Three years later, in 2005, the tournament returned to Japan with a shorter revised format. FIFA also presides over World Cups in modified forms of the game including beach football (the FIFA Beach Soccer World Cup) and futsal (the FIFA Futsal World Championship). The laws of football which govern the game are not strictly the responsibility of FIFA. They are maintained by a body called the International Football Association Board (IFAB). However, FIFA has a 50 percent representation on the IFAB board (four representatives); the other four are provided by the football associations of England, Scotland, Wales, and Northern Ireland, in recognition of the unique contribution to the creation and history of the game by the nations now comprising the United Kingdom. In 1904, FIFA declared it would adhere to the rules laid down by the IFAB. The growing popularity of the game internationally led to the admittance of FIFA representatives to the IFAB in 1913. Map of the FIFA World with the six confederations. FIFA is an association established under the Laws of Switzerland. Its headquarters are in Zurich. FIFA's supreme body is the FIFA Congress, an assembly made up of a representative from each affiliated national federation. The Congress assembles in ordinary session now once every year, and extraordinary sessions have been held once a year since 1998 upon request. Only the Congress can pass changes to FIFA's by-laws. The Congress elects the President of FIFA, its Secretary-General and the other members of FIFA's Executive Committee. The President and Secretary-General are the main office holders of FIFA, and are in charge of its daily administration, carried out by the General Secretariat, with its staff of 208 members. FIFA's Executive Committee, chaired by the President, is the main decision-making body of the organization in the intervals of Congress. FIFAs worldwide organizational structure also consists of several other bodies, under authority of the Executive Committee or created by Congress as Standing Committees. Among those bodies are the Finance Committee, the Disciplinary Committee, and the Referee´s Committee. Nations straddling the traditional boundary between Europe and Asia have generally had their choice of confederation. As a result, a number of transcontinental nations including Russia, Turkey, Armenia, and Azerbaijan have chosen to become part of UEFA despite the fact that the bulk of their land area is in Asia. Israel, although lying entirely within Asia, joined UEFA in 1994, after decades of isolation by many of its Middle Eastern neighbors. Kazakhstan was the latest nation to make the move from AFC to UEFA, in 2002. Guyana and Suriname have always been CONCACAF members despite being South American countries. Australia joined the AFC from the OFC in 2006. No team from the OFC is offered automatic qualification to the World Cup; instead the winner of their section must play in a play-off against a CONMEBOL side, a hurdle over which Australia has traditionally fallen. Perhaps ironically, Australia successfully qualified for the 2006 FIFA World Cup by winning just such a playoff in a penalty shootout against Uruguay, just a few months after the clearance to move was granted. In total, FIFA recognizes 207 national federations and their associated men's national teams as well as 129 women's national teams. FIFA has sometimes been credited with yielding more influence over certain nations than the United Nations. The FIFA World Rankings are updated monthly and rank each team based on their performance in international competitions, qualifiers, and friendly matches. The rankings went through a revision in 2006. There is also a world ranking for women's football, updated four times a year. FIFA awards, each year, the title of FIFA World Player of the Year to the most prestigious player of the year, as part of its annual awards ceremony which also recognizes team and international football achievements. As part of its centennial celebrations in 2004, FIFA organized a "Match of the Century" between France and Brazil, the most successful national teams of the last decade. In addition, it commissioned arguably the most famous player ever, Pelé, to produce a list of the greatest players of all time. This list, the FIFA 100, included 50 players who were still actively playing at the time of publication (one of whom was female—Mia Hamm), and 75 retired players (including Pelé himself and one woman—American star Michelle Akers—but not including deceased players). The list was originally planned to be just 100 players long but Pelé is understood to have found it too hard to choose just 100 and so the list actually names 125 players. FIFA announced in April 2004 that it is expecting to earn $144 million profit on $1.64 billion in revenue between 2003 and 2006 (the 4 year cycle including the 2006 World Cup). Allegations of financial irregularities and bribery plagued FIFA in 2006. ↑ Andrew Jennings, "FIFA chief's World Cup Ticket scam," Daily Mail, London, September 12, 2006. Sugden, John. 1998. FIFA and the Contest For World Football. Polity Press. ISBN 0745616615. Trecker, Jim, and Charles Miers (ed.). 2000. Women's Soccer: The Game and the Fifa World Cup. Universe. ISBN 0789305275. All links retrieved August 8, 2017. This page was last modified on 8 August 2017, at 15:49.